Short Version: Good course, well organized race, poor performance. There are a group of 4 guys and I that have run a few races together over the last couple of years. One of them decided to sign us up for a local 10k sponsored by Key Bank and the City of Tacoma. Last year was the inaugural race and they had changed the course this year to make it less of a mountain climb. The course is a simple out and back. The organizers were hoping for a total of 2000 runners for the 5k run/walk, 8k race, and 10k race. I don't think they made their number goal but they were certainly well prepared for it. We opted for the 10k. We got downtown too early, picked up the race packet (including Champion Chip) and then went out and warmed up for about a 1/2 hour. The sun was out, the sky was completely clear and a crystal blue, and it was warming up quickly. I lined up reasonably close to the start with my friend Bill. At the gun I immediately got boxed in and lost Bill. The start goes uphill gradually climbing 75' for 3/4 of a mile before dropping 100' in the next 1/2 mile. I finally was able to break free after a 1/2 mile but couldn't see Bill ahead of me. I hit the first mile in a very disappointing 6:39. I really knew at that point that this was not going to be a good day. I kept passing other runners down the hill to the flat and finally spotted Bill a ways ahead (his first mile was 6:20). My second mile was at the pace I had planned on 6:20 but I was working pretty hard to try and reel Bill in. I finally caught him a little past the 2 mile mark. As I came up on his shoulder, he didn't have to even turn around to know it was me. I sound like a steam locomotive with leaking lines and an out of round drive wheel when I run. I continued to leave Bill and then the course has a slight hill here where we head up and over an overpass. I lost focus during this stretch. 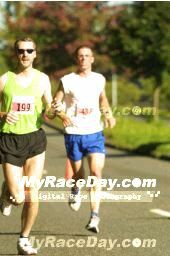 I wasn't aiming to pass anyone in particular, wasn't being pushed by anyone, and was passing those few runners who were fading early in the sun. 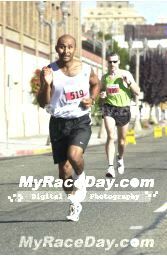 In essence, I was just being lazy and running, instead of staying focused and racing. Mile three was a dismal 6:38. I kicked myself some for being an idiot and tried to focus on passing some more runners after the turn around. Mile 4 included a bigger hill since the road-way split with this portion going higher up the hill than the out-bound portion had. 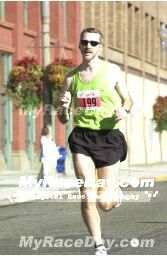 I was continuing to catch runners one at a time, but still was pretty week mentally. I started to hear a guy behind, an older, shorter, bald, Hispanic guy, who I had passed in the second mile, come up behind me. Every time he would catch someone, he would encourage them loudly. His voice kept getting nearer. Mile 4 was 6:35. I was dying and hadn't even gotten to the hard part of the course yet. 'Baldie' finally caught and passed me in the 5th mile. I tried to keep him in range and together we caught another runner just before the mile 5 marker at the base of the hill. Mile five was another disappointing 6:37. I lost touch with Baldie on the hill. He took off and I died like I normally do on hills. The recently passed runner (who looked to be in my AG) caught and passed me on the hill, again just over a 100' climb in a 1/2 mile. At the top of the hill with just over 3/4 of a mile to go we could see a very long, and very hot ribbon of concrete stretching out ahead of us with a nice downgrade. 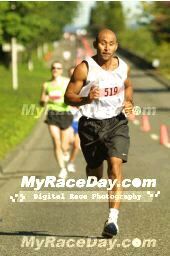 I was worried about being passed by more runners so I picked up the pace to retake the guy that caught me on the hill. I even started to close the gap on Baldie but he was still about a 1/2 a block ahead of me. Mile 6 was 6:41 (I'm a lousy uphill runner). I didn't want to risk breaking stride to look over my shoulder but I really wanted to see if anyone was going to make a move on me. Finally, about 200 meters from the finish the announcer called my name. He then shortly commented "we have a good finish here folks". I didn't know what he meant. I certainly wasn't making a move on Baldie, so... that meant that someone was moving on me! Too late! Some young guy was kicking up beside me in stealth mode. I started a frantic kick. It was close, but I think I just beat the young guy and we both beat Baldie at the finish by a second since the young guy and I caught him by surprise and Baldie wasn't able to repond fast enough. Of course I forget to stop my watch at the finish so I don't know what my final time was but I'm guessing around 40:45. Well off my 40:00 goal time. The only good news was that I beat Bill by maybe 30 seconds, only the third time in my life. Post-race goomies were great; ice-cream, fruit, Starbucks Coffee, PowerAde and water. There were so many goomies that even after the 5k walkers finished there was plenty to go around and we went back for seconds and thirds (so much for loosing weight). They had problems getting the age group results out so we finally headed for the car our hands stuffed with goomies. My chip time ended up being 40:43 and 3rd out of 54 in my age group. Baldie was actually 5 years my junior and beat me by a second Chip time even though I beat him by a second Gun time. The "young guy" turned out to be 25 years old and I beat him by 2 seconds Chip time even though we both had the exact same Gun time. The nice thing was that the race sent out a nice duffle bag embroidered with the race logo for my third place finish. This was the first I've ever won something of value at the race. I was thrilled.